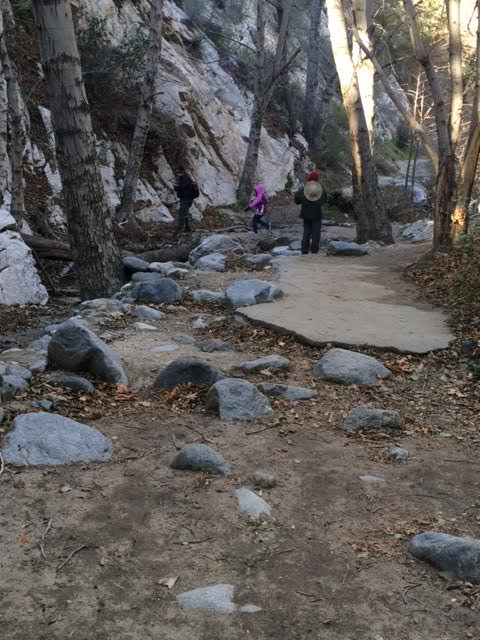 My family took a hike together along a fire road at Turnbull Canyon the other day and we had a great time. If you zoom in along Turnbull Canyon in Whittier on Google Maps, you'll notice fire roads shooting out from Turnbull along the green hillsides. All of the fire roads are accessible trails for pedestrians, equestrians, and mountain bikers. The trails are maintained and the hillside preserved by Habitat Authority. Trail maps with distance and elevation information can be found here. There is no fee to hike the trails. Only park your car along the roadway in designated areas, bring along some water, and have fun with the family. 22 cars parked along Turnbull Canyon at Rose Hills No. 3 Fire Road. The gate marking the trail. Rules & warning signs at the trailhead. The trail is clear and wide enough for two vehicles to drive side by side. The trail is compacted dirt with small natural channels where water runs through. Smooth enough for jogging strollers, but it may be a bumpy ride for infants. Hikers, joggers, families, people with dogs, and mountain bikers share the trail. The view from 1.1 miles along the trail. On a clear day Catalina Island is in plain view. We stopped at the bend in the trail at the viewpoint pictured above. My 6-year old started saying she was tired and that is when we turned back. The trail was uphill most of the way, but it was a very gradual incline, easy enough for beginners and little kids alike. For more information visit HabitatAuthority.org. My family found another great hiking trail today at the Switzer Picnic Area on Hwy. 2. There is a trail that follows a stream in the mountains above La Cañada. We hiked in about a mile with the kids, but were told it would be another half mile to the falls. We didn't have time to continue on, but we plan to go back another day. If you go I suggest bundling up with gloves, hat, and a warm jacket. Wear shoes that are okay to get dirty, or waterproof boots. Bathrooms are available at the trailhead. The trail crosses the little stream several times which is kind of cool, but our youngest ended up with muddy shoes and I slipped and had to walk back with a wet shoe. It was fun though. Also, dogs on leashes are welcome! Click here for more information about Switzer Falls.